Twin Cities Startup Week 2018 was a great success for Lunar Startups and the companies in Cohort 1. Each of the companies participated in events throughout the week including panels, podcast recordings, pitch sessions, and award winners at the closing event. Read below to learn more about the cohort’s experience. Danielle Steer, Managing Director of Lunar Startups, sat on a panel about the importance of investing in diversity. See the Star Tribune’s write up by Neil St. Anthony here. Graticus hosted a great event that showcased Tech in St. Paul, the Best Kept Secret in the Twin Cities. Lunar Startups, Take 12, and Monicat Data shared exciting updates and opportunities around innovation in our community. Caroline Karanja, 26 Letters, joined three other change-makers for the live recording of Social Entrepreneur Podcast. Her interview will be available on November 19th. Jamie Glover and Fatimah Hussein, co-founders of Asiya, shared about their Venn Foundation experience during “Program-related Investments for Early Stage Social Businesses”. Our friends at GoKart Labs hosted the second annual TCSW awards. Asiya Sportswear won the award for “Packs a Punch,” creating the largest impact with their business for Muslim women and girls in sports. While managing director, Danielle Steer, took home the UFFDA! Award for her advocacy work for startups across MSP. 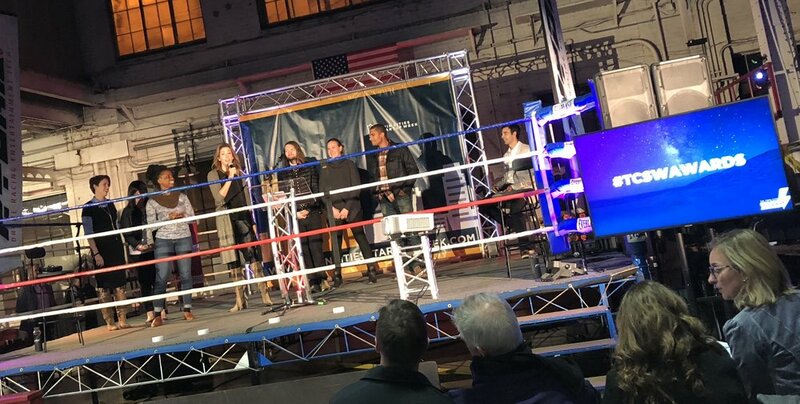 All six of the Cohort 1 companies were able to get in the ring to share more about the program and their participation.